Although when it comes to pest control we often automatically think of pesticides, before the rise of these readily-available, artificial products a wide range of home grown remedies would once have been employed to ward off the unwelcome attention of common pests. Wonderful sounding concoctions made from bracken, elder, horsetail – the plant, not the animal! – nettle, rhubarb, seaweed and even urine were routinely used. In the UK, all pesticides are closely regulated – and the legal definition of a pesticide covers just about anything used in pest control, even, strictly speaking, extending to old favourites like soapy water sprays for aphids. Preparations used to protect plants are the responsibility of the Pesticides Safety Directorate, while the Health and Safety Executive control those used for other purposes. It is now illegal to use any preparation as a garden spray, or treatment, which does not have formal approval for such use, so it is not possible to try out some of the old recipes which have survived, though they remain interesting historically. However, even today the average store cupboard still contains a wealth of ingredients with natural pest control properties. Many herbs, for instance, are said to be effective, either to repel pest in the first place, as mint is said to do for mice, or to combat those already present, such as chives and feverfew – as a spray – have been reported as doing with a variety of leaf-eating insects. Sage, thyme and rosemary have been shown to reduce the number of eggs laid by pests and some gardeners have found that growing these plants alongside cabbages and other vulnerable crops minimises caterpillar damage. Members of the allium family – chives, garlic and onions – also have an enviable reputation, both for prevention and cure and there seems to be few pest species immune to their characteristically strong smells. Grown in the garden, they are said to keep aphids away and the use of garlic oil, particularly, is widely known amongst organic gardeners; crushed cloves and chopped onions have also been used to keep kitchens and outhouses pest free. Capsaicin is a naturally occurring chemical with strong insect repelling abilities, which is found in a number of common kitchen ingredients – black, red and chilli peppers, ginger and paprika. Effective even in quite small quantities, just a few grams dusted around plants has been shown to ward off insect pests and while it would be an expensive way to protect a whole cabbage patch, it might be useful for a favourite houseplant. The same effects have also been reported for home-made pepper sprays. Many of the essential oils have anti-insect properties. Cedarwood, citronella, garlic, eucalyptus, soy bean oil, peppermint, lemongrass and, of course, garlic seem decidedly unattractive to insects – but this can be something of a double-edged sword. While they may help keep pests at bay, they can also keep beneficial insects away too. Never-the-less, they have been used by enterprising pet-owners against fleas and ticks – though they should never be applied directly to the animal in a concentrated form. 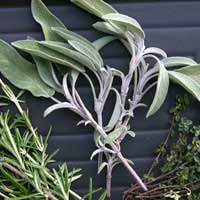 Fresh rosemary – dried and powdered – has also been found to help control fleas, as have eucalyptus, fennel, wormwood and rue. Some of the weapons in the cupboard armoury are very well known. Aside of the use of soapy water sprays against greenfly mentioned earlier, other old favourites include the likes of a saucer of beer to intoxicate and drown slugs and boiling water to deal with a nest of ants. Others, however, may be less familiar. Baking soda, for example, in water and with a little vegetable oil, has been used as a fungicide, while both diluted cider vinegar (organic varieties are claimed to be the most effective) and equal parts of water and milk are said to work against moulds, mildew and black-spot. Even our bad habits can help us fight pests – cigarette butts can be soaked in water to form a spray, though this is, of course, another one definitely not to be recommended. “Smoking kills” as the health advice warns and small wonder when you consider that nicotine was one of the top insecticides used, back in the late nineteenth century. It would be impossible to end a discussion of cupboard pest control without a mention of salt. Leaving aside the rather sadistic side of pouring salt on slugs and snails to watch them melt, it really is best avoided anywhere other than patios and paths, if only because of what it does to the soil. After all, there is little point in protecting your plant from having its leaves eaten, simply to poison it at the roots! The natural pest control properties of so many common place items makes a fascinating study – and, if nothing else, makes you realise that our ancestors knew a thing or two! Continue giving us more information on pests and its control.i'ould like to learn more since i'm a farmer in rural areas.